All my favorite cheap eats in Chiang Mai so you can have great food without blowing the bank! I was always on the lookout for cheap eats in Chiang Mai as I stayed there a lot longer than originally planned. 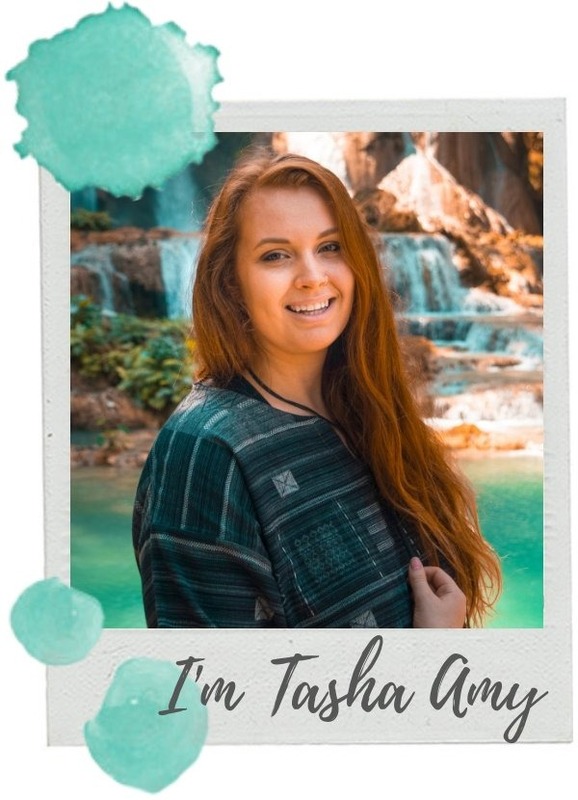 This was due to getting sick, so a lot of my days were spent in my hostel bed at Kikies House, as well as waiting for James to fly over to meet me. As a result of these events I ate at a lot of different places in Chiang Mai over the nearly three weeks I was there. These are my favorite cafes, restaurants and food outlets which are backpacker friendly, tasty and of course cheap! All tested and tried my yours truly. 1 All my favorite cheap eats in Chiang Mai so you can have great food without blowing the bank! If I had a dollar for every time I craved Indian food I would have enough money to fund my travels. Okay, not seriously, but I absolutely love Indian food and have tried it in nearly every country I have traveled to. New Delhi Indian Restaurant was one of three Indian Restaurants I have eaten at in Thailand and I had a few great meals here. As always the portions are large and will for sure keep you full. They have both indoor and outdoor seating with fans and air con. It is a great place to chill out after a busy day to people watch from the balcony with a cold beer. While there I paid $7.50 for a curry, rice, naan and soda. One of my favorite things to do in Chiang Mai is exploring all the amazing markets. With such a variety no matter what day of the week it is I promise you will be able to find a market very easy. My personal favorite is the Sunday Night Walking Street Market which is the largest market in Chiang Mai set up 1km along Ratchadamnoen Road. With such a wide range of food available at the markets it should be your go to place for cheap eats in Chiang Mai. Honestly you cannot go wrong with pad thai and a smoothie. The samosas cost me $0.75 for three pieces and the coconut ice cream cost $1.00. When? Everyday, from 5pm till noon. Location: Chiang Mai South Gate. Just at the opposite side of the Chiang Mai Gate. Rat Chiang Saen road. Location : Chiang Mai North Gate / Chang Puak Gate. When? Every Saturday, 5pm – 11pm. Bagel House Cafe & Bakery is my favorite breakfast place for cheap eats in Chiang Mai which make a delicious start to the day. With freshly made bagels and fresh produce it hits the spot. The cafe is set on a quiet road off one of the main streets with both indoor and outdoor seating areas. Also there is a counter cabinet displays the bagel range for the day and the friendly staff always greet you with a smile. The meals are all put together in a small area out front and are served with a fresh slice of fruit. Though, because of the small preparation area sometimes there is a bit of a wait, but trust me its worth it. I paid $3.60 for a yummy egg, cheese and avocado bagel and a drink which was my regular order the numerous times I visited here. 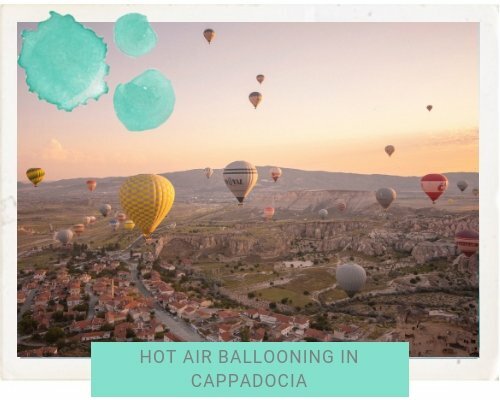 Located near a the beautiful temple of Wat Lamchang a visit to By Hand Pizza Cafe is the perfect way to spend a warm evening. The pizzas are made right in front of you in the massive pizza oven out front. The freshest ingredients are used and music is always playing. This place definitely has a great atmosphere with an excellent section of drinks. 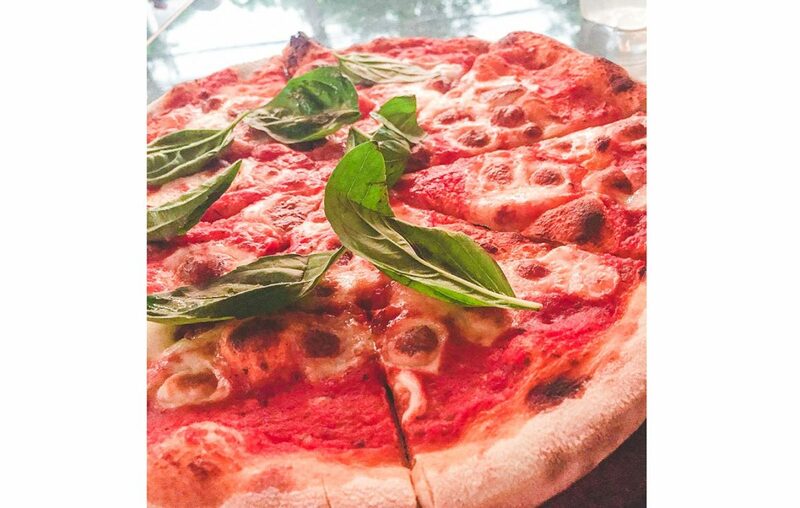 There are so many options of pizza to choose between, from the classic margarita to vegan options and meat lovers deluxe. No matter your food preference here you are bound to find something you will love. I spent $6.00 for a regular pizza and a drink. 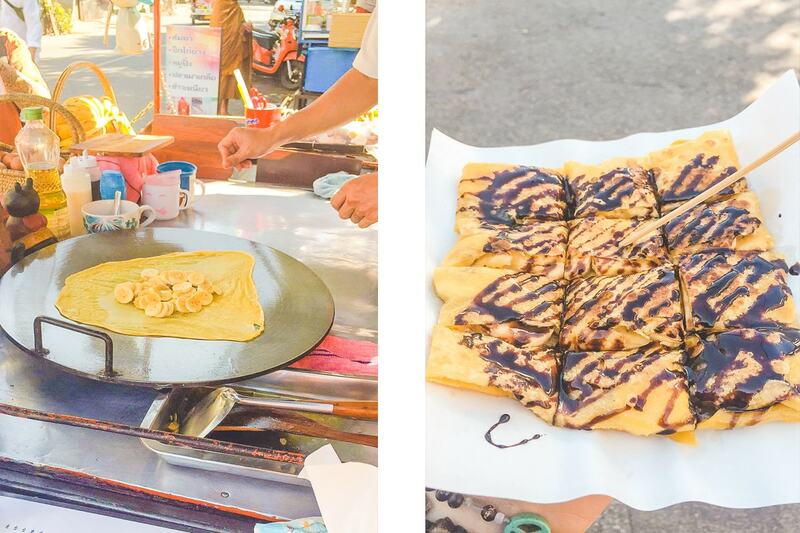 The treats from the Crepe Stands around Chiang Mai are part of the staple diet for any backpackers traveling Thailand and I love them. They are oily fried sweet goodness covered in chocolate sauce or condensed milk. If you are currently traveling Thailand and haven’t had one yet, please do! They make for the perfect dessert and there are usually also savory options if that’s what you’re craving. My regular Crepe stand in Chiang Mai is located next to Wat Chiang Man and opposite the Seven Eleven on Ratchapakinai Road. There is no real set time when the Thai gentleman that runs it is there, but it is usually around early lunch until late dinner hours. He is very friendly and makes a damn good crepe for around $1.00. My favorite is condensed milk and banana. 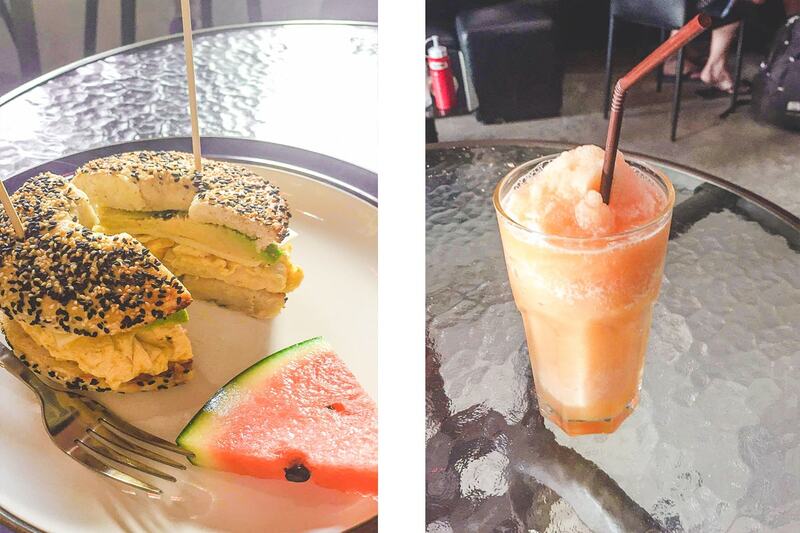 Vigie Sist Cafe is the perfect place for delicious baked goods and a relaxing drink. I loved coming here when I was craving a wonderful slice of cake or something a little sweet. 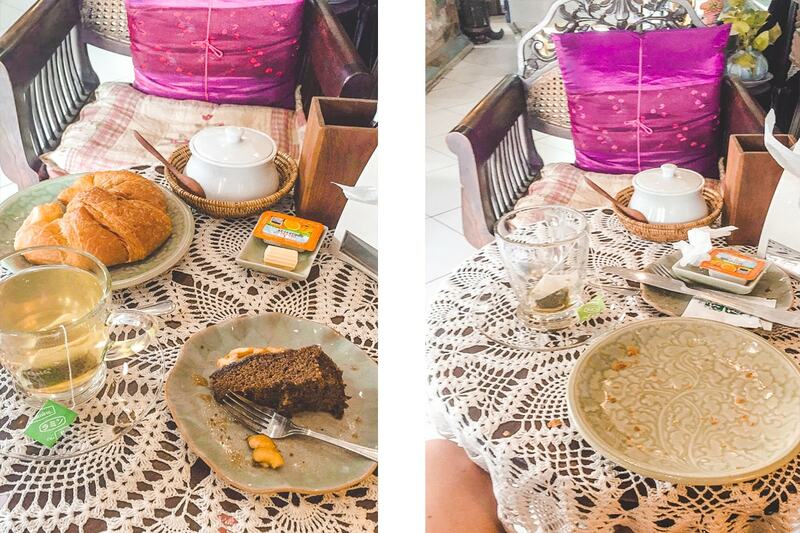 In Chiang Mai I found it quite hard to find a cafe with a cabinet which had cakes etc so Vigie Sist Cafe was a life saver! They are actually quite known for their amazing baked goods, sweet frappes and iced drinks! Its the best way to cool down in the Thai heat. I also love the decor in here! With a dark wood Lanna feel and so many nick knacks hanging about I could spend hours looking around inside and still not even see it all. Furthermore, the tables are covered in cute white doilies which makes the perfect place for a tea or coffee. I paid $3.75 for a croissant, cake and a tea. 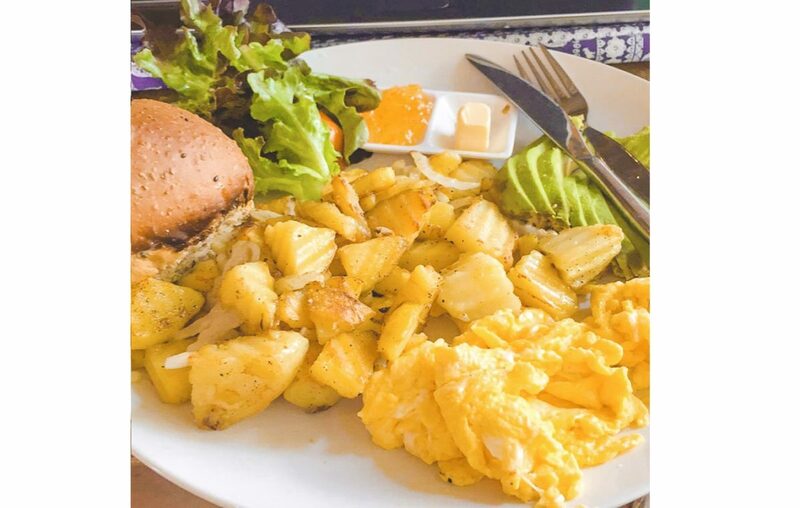 An extremely popular option with the expat community in Chiang Mai is Blue Diamond Breakfast Club. Walking in there is like a beautiful oasis with a river running through the middle of the outdoor area and a little waterfall. The space is abundant with greenery which provides a lot of shade and feels like you’ve been transported to the jungle, a stark contrast to the Chiang Mai streets outside. The triangular ground pillows you find all over South East Asia are set up alongside low set tables. There are also regular tables inside the restaurant itself and directly outside. The food here compliments the decor with the freshest ingredients used. There are numerous vegan and vegetarian options which is perfect if you have any dietary requirements. The portions are massive and you will definitely be full by the time you leave. It will give you plenty of energy to go out and explore the amazing Chiang Mai temples. I paid $5.40 for scrambled egg, roast potato, avocado with a bread roll and a green tea. As well as all this there are also cabinets of freshly made baked goods ranging from cinnamon rolls to bread, to muffins and cheesecakes. You will certainly leave having had a great experience! Just be aware they are not open on Sunday; I found this out the hard way. What would a cheap eats post be without mentioning the staple eatery for a budget meal in Chiang Mai. 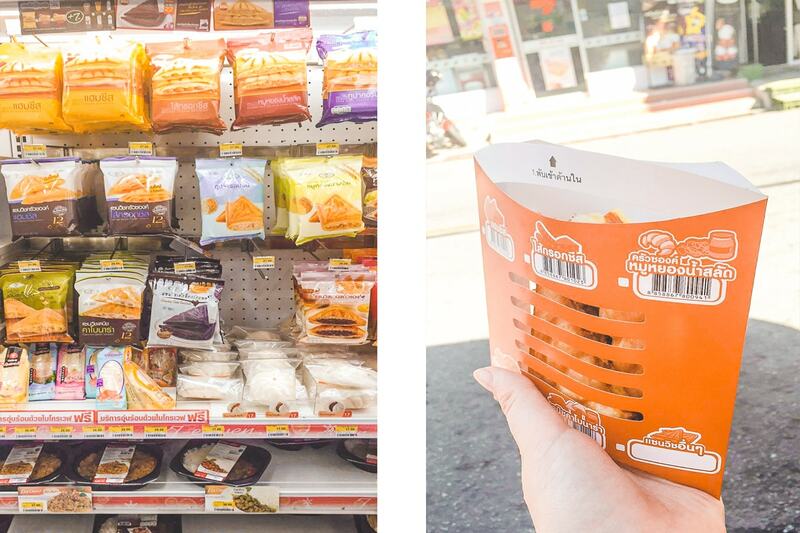 Seven Eleven caters for the budget conscious traveler who isn’t fussed about a sit down meal by providing the quickest and most cost effective option. Hot meals are still available which separates it from a lot of convenience stores you would regularly find with microwaves, sandwich presses and boiling water. Toasted sandwiches are available from as little as $0.60 with options from jam to cheese and sausage and even chocolate! You can even choose between regular bread or croissant bread. There are so many options it is unlikely you will ever get sick of having seven eleven toasties! As well as the generic toasties there are also burgers, sausages, noodles and prepackaged microwave meals. I can not tell you how many times I have eaten lunch or dinner on the stairs of a seven eleven! 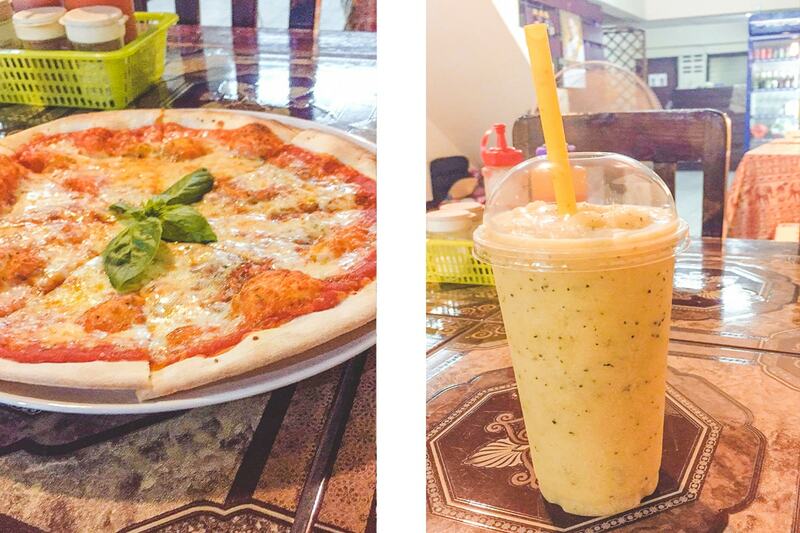 The Thai owned Uno Pizza Italy and Thai Food Restaurant provides great food for an even better price. The decor is simple and maybe a little too ‘homely’ for some peoples preference (I am pretty sure the back of the restaurants is a families living room). Though, if you are looking for simple and good food this is the place to be. The owners are lovely and while I was visiting the young daughter was dancing to the background music out back. Soon afterwards a family friend appeared, it is a really homely feel. Though, if you are not bothered by a relaxed atmosphere and basic decor this is the perfect place for you! I paid $6.15 for a margarita pizza and a passion fruit smoothie. Why on Earth did i read your post at lunch time!! Now i’m totally looking at my plate (salad and quinoa) sideways while pouting!!! not so funny…all these options look awesome! I am totally pinning this for future reference!! Nice! Everything looks amazing. By brother is going to Thailand soon, so I’ll be forwarding this to him. Hey there!! So a couple of things, I love all your images! They all look so universal and it’s really nice! All the food looks amazing! Secondly, I love that you shared the opening hours and locations of things! I have never been to Chang Mai but when I go I don’t have to worry about where I am going to eat!! Just had a some moments of my mouth open in awe of this spread of food in Chiang Mai. Literally want to buy a ticket and just go, and just eat now. Thanks for the tips, noted for my asia trip. I’m absolutely drooling right now! These all look so delicious – I’m definitely keeping these in mind for when I finally get to Chiang Mai! This post has my mouth watering. I was in Chiang Mai recently and ate my face off. I could spent years there just eating! Oh perfect! What month are you visiting? These look so delicious! Chiang Mai is very high on my bucket list and I, like most people haha, love food! Will be saving this for later 🙂 Thanks for sharing! It sounds like I need to visit Chiang Mai just to eat! I love how budget friendly this city is. And I’m sure there are tons more to choose from too! Oh I would so go back just for the food! Haha! I had the best night at Mew Delhi Indian restaurant and many trips to 7/11 (all praise the 7/11 for budget travel!) 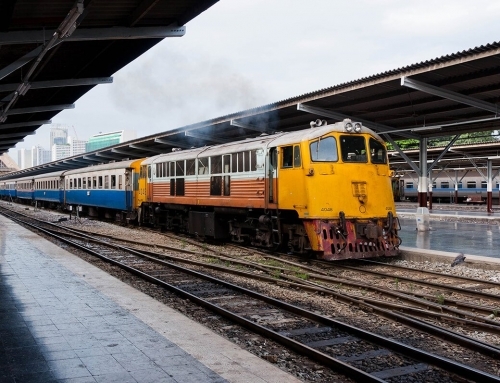 I would love to return to Chiangmai and try some more of the spots on your list. The blue diamond breakfast club looks gorgeous!!! Haha seven eleven is the best! Chiang Mai is full of amazing dining spots, I swear it is food lover heaven! Enjoy your time there! Definitely plan your trip so you are staying over a Sunday night as well. Seriously, the night markets on a Sunday are amazing! I think I might just need to book a flight there so I can eat all this delicious goodness!!!!! And what’s in the photo for the food you had at night markets? Looks kinda like a dessert and I’m definitely intrigued! Haha I would so go back just to eat! Thats coconut ice cream so theres is ice cream with shaved coconut, the blue stuff is rice, the red fruit is some kind of jelly lolly (I think?) and the yellow stuff I am not sure about but it was crunchy and delicious! 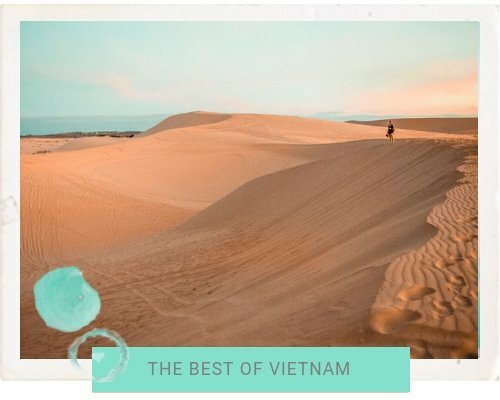 Haha I only wrote about the places I visited so I can share my experience and decide whether they are good enough to mention. You have definitely listed some places I will have to try next time though! AHHH! loved this post! I am so hungry now! so many great places to try when I go for new years! I am so hungry now(!). Great post and love that you’re including your own commentary too. That avocado bagel looks like the stuff of dreams, think I’ll have to try and replicate that at home!! Yeah, to be fair I can imagine myself burning the egg and mashing the avocado….maybe we should leave it to the professionals lol. You have some awesome suggestions here! Weren’t the roti crepes amazing? They are so good and so cheap! Oooo that all looks delicious! I hear the food there is amazing and I am dying to get over there! Thanks for sharing these spots! I had so much fun at the Sunday night market when I was in Chiang Mai! I’d love a banana pancake right about now, and Blue Diamond is definitely on my list for my next trip to Chiang Mai! yum yum yum, I want Roti right now !! YUM. 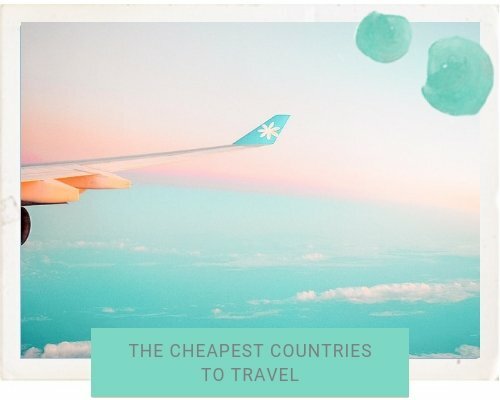 All of these places look incredible! I’m so hungry right now. Ha! Thanks for sharing such a comprehensive rundown of some of the best spots to eat in Chiang Mai! Love asian food especially Thai, we’ve travelled all over the country but not made it to Chang Mai yet, must go back one day soon. I LOVE that you included 7-11. I have no idea why toasties aren’t a worldwide staple of 7-11’s. Hmmph. Chiang Mai is awesome. I too, stayed much longer than expected. Oh and those pancakes/crepes/delicious things…I never knew I needed them in my life until I tried my first one…sigh. Haha I couldn’t forget 7-11! I know, they totally should be! We don’t even have 7-11 in New Zealand where I am from 🙁 Haha its one of those places you arrive at and never want to leave. love it. I was in Chiang Mai and loved the food there. What I can’t still get over with is Khanom Buang. I so want to be able to cook it here in Kosovo, but it’s hard to find the ingredients. 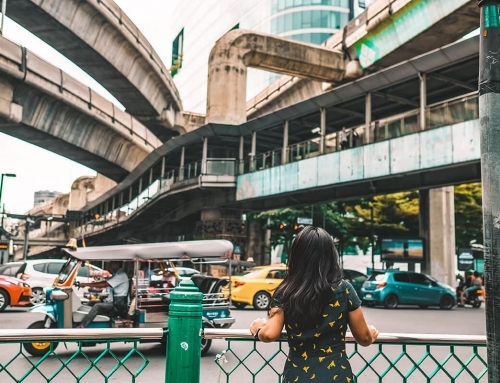 Chang Mai is one of the places I’m considering for when I become a digital nomad, I hope to check out some of these places. You’re making my hungry! Honestly it is such a livable city and there is a great digital nomad community! I feel like I am constantly on a diet in between trips so that I can have room to gain weight when I do travel! The pest part of traveling to a different country is trying the food! This all looks so delicious! Omg, all of this food looks absolutely amazing! I’ve always wanted to go to Chiang Mai (it’s in my plans lol) and one of the reasons being the food! That crepe looks bangin’ by the way! lol I’m bookmarking this post for the future…Thanks for all of the great info! Honestly the food there is amazing and there is such a great range as well! That crepe was damn good! I absolutely loved Chiang Mai but didn’t get into the cheap eats like I wish I would’ve. Definitely saving this for next time! 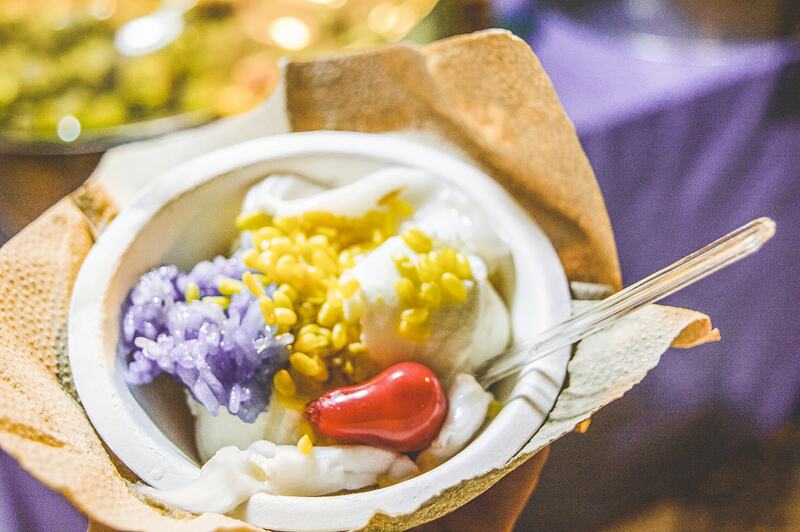 What a great piece for eating your way through Chiang Mai! I havent been here yet, but this is exactly what i need for when I do. I need more crepes in my life…though I havent had them with condensed milk. Didn’t even know people did that! I love banana crepes though. I love indian food! 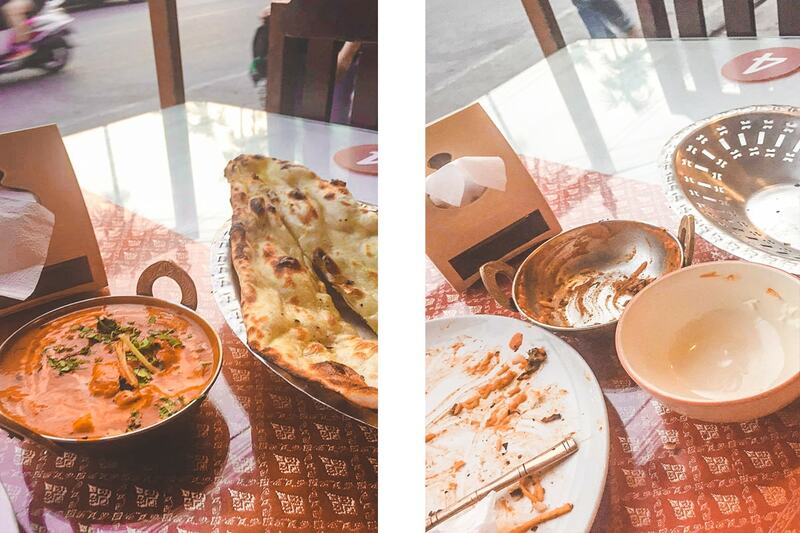 I ate so much Indian in Japan – always great vegetarian option. I cant believe you found pizza and bagels in chiang mai! I mean I am a NYC girl, so love my pizza and bagels! True, such a good vegetarian option! Haha honestly the best bagel I have ever had! The roti stands are the best!!! I miss those so much! awesome eats! Makes me want to go back!!!! omg you just got me so hungry! the food all look delicious! and cheap! i might just go there and have a foodtrip of a lifetime, no? Cannot wait to try these!! I’ll be there in November for the first time. Oh thats exciting! How long will you be there for? Ah I miss those street-side crepes/pancakes!! There’s a great night market (very local, very non touristy) up from the Nimman area, next to the University which has some amazing food for 40-60 Baht for a meal. Trying to remember the name of it now!! Oh will have to check it out next time I am there! Haha I swear my partner is the same as well. I guess men love their toasties! Oh cereal and marshmallow, that sounds amazing! I will always remember the roasted bananas in the night market… it was amazing! Unfortunately when I was there last year I didn’t visit any of these places, though to be honest, I ate like a pig all 5 days I spend there. The food in Thailand is always so amazing…! Thanks for the compilation and prices! Oh roasted bananas!? That sounds so good, how did I miss it! Great post! Lots of useful places to stop. I was in Chiang Mai earlier this year and my favourite was the giant spring rolls from the Saturday night walking market. So cheap and sooo delicious! 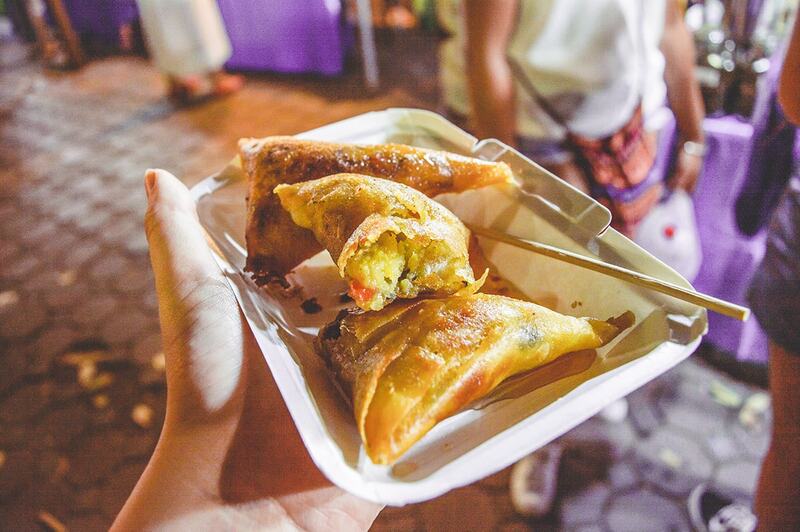 The food in the night markets are amazing!